John "Jack" G. Schumacher (1888-1942) was a brother of my grandmother Anna (Schumacher) Gerken. John Schumacher married Mayme M. Wilhelm (1904-1998). They lived at Dubuque, Iowa, where Jack worked at Morrison Brothers. From 1910 to 1926, Jack had served in the U.S. Navy, on the U.S.S. Utah. T.L. John G. Schumacher was born on April 18, 1888, at East Dubuque, Illinois, the second child of George and Mathilda (Uthe) Schumacher. His brothers and sisters were Frank, Joseph "Joe," Louise, and Anna. Their mother Mathilda died in 1897, and later that same year George Schumacher married Catherine Fuerstenberg. Catherine brought a daughter Josephine into the marriage, and George and Catherine had six additional children of their own: George, Margaret, Louis, Henrietta, Albert, and Mary. Circa 1903 the Schumacher family moved from East Dubuque across the Mississippi River to Dubuque, Iowa. In 1905, according to that year's Wisconsin State Census, at age 17, John Schumacher, who was called "Jack," was living and working on the farm of his uncle and aunt, John and Margaret Uthe, in a household that also included his grandmother, Barbara Uthe. 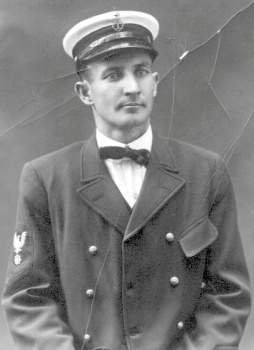 Jack Schumacher had returned to his father's household in Dubuque, Iowa, by 1910, and it was in September of that year that he enlisted in the United States Navy, and he would remain in the service until 1926. He served on the U.S.S. Utah. He wrote a letter to his father George on April 26, 1914, from Vera Cruz, Mexico, five days after marines and sailors from U.S. naval vessels took the city. In 1914 the Utah played an important role in the American landings at Veracruz, Mexico. Mexico, torn by civil war and revolution, was the scene of considerable American intervention, much of it centered at Veracruz and Brig. Gen. John J. Pershing's forays into northern Mexico. The Utah was deployed twice at Veracruz, first from February to April 1914, when it anchored off Veracruz and transferred refugees to nearby Tampico, and again in late April to June 1914 when it joined other American ships in an attempt to contravene the landing of arms shipped from Germany to Mexican president Victoriano Huerta, who had succeeded the assassinated legal president, Francisco I. Madero. President Woodrow Wilson, eager to support Madero backers and anti-Huerta revolutionaries as part of his international campaign for human rights, and seeking the means to stabilize war-torn neighboring Mexico, sent in troops. Marines and sailors landed from the U.S. Naval vessels, including Utah, took Veracruz on April 21, 1914, seized the customhouse and prevented the landing of the arms. In the action, seven members of the Utah's crew distinguished themselves and received Medals of Honor. Considerable Mexican casualties embarrassed the United States and led to an American withdrawal, but the action was one of a series of maneuvers that led to Huerta's downfall and the installation of a new government. edited, from "History of the USS Utah"
View historical photographs of the U.S.S. Utah: USS Utah Actions & Activities, 1911-1944. Just a few lines to let you know that I am well yet and hope the same of you and the rest of the folks. Well, Dad, I have been to war and had quite a time of it. The scrap was a hot one from 1 o'clock in the afternoon until 8:40 the next morning and it was a continual fire for about 22 hours and I did not get a scratch but I know I got two of the [Mexicans] to my credit. We captured the custom house, post office, hotel, terminal, cathedral, police station, military prison, and the naval academy. The academy was a total wreck, and we found 26 dead federals in one room, and it cost us 2 men to capture the police station. That was all the men that we lost from our ship and about a dozen wounded. The Florida lost the most men and altogether in the fleet there was about 20 killed and about 50 wounded seriously. We shot 16 prisoners of war and we got about 160 more. I don't know what they are going to do with them. They had a funeral here and there was about a dozen dirty looking Mexicans walking along behind the hearse and it looked phony to us so we stopped the hearse and opened the coffin and all we could find in it was ammunition, so we took the whole funeral down to the station and locked them up. I certainly had lots of fun down here while the fight lasted but I don't think I care for any more of that kind of fun as the next time I might get picked off with a chunk of lead. Well, the troops are due in today, and I think we will get back to the ship as there are only about 100 men aboard now and I think it keeps them pretty busy. Well, I must close for this time; hoping to hear from you soon. I am as ever your Loving Son Jack. U.S.S. Utah, c/o Post Master, New York, N.Y. Excuse pencil and paper as I forgot to bring pen and ink. P.S. Can you inform me what Uncle Sam is doing here? We capture the town and are fighting like hell and I don't know why. I can't get any information whatever as to the state of affairs in the States. Will try and bring home a young Mexican arsenal with me next fall. I got a couple of ferocious looking pieces of hardware that I picked up after the fight. A report circulated that John G. Schumacher was shot to death in the encounter with Mexicans at Vera Cruz, which his brother Frank Schumacher verified to a Dubuque Telegraph Herald reporter was not true, that John Schumacher was very much alive. Frank Schumacher stated that a marine by the name of John F. Schumacher had been killed, but that he was on the battleship Florida, while his brother John was on the Utah. The Telegraph Herald ran the story with Frank's disclaimer on April 26, 1914, which ironically was the day that Jack wrote his letter home from Vera Cruz. Jack Schumacher marries Mayme Wilhelm. On April 13, 1926, John G. Schumacher married Miss Mayme M. Wilhelm in San Diego, California. She was born on May 21, 1904, in Kieler, Wisconsin, daughter of August and Mary Catherine (Jenneman) Wilhelm. Jack and Mayme Schumacher lived in Dubuque, Iowa, where in 1930 their household consisted of John and Mayme; two daughters, Anna Mae, age 2, and Rose Marie, age 1; and Mayme's brother, Ray Wilhelm. In 1940, their household consisted of John and Mayme and daughters Anna Mae, age 12, Rose Marie, age 11, and their third daughter, June Laurine, age 9. John and Mayme also had two sons who evidently died as infants. Jack was employed as an electrician welder at the Morrison Brothers plant in Dubuque, Iowa, until his retirement in 1939 due to ill health. Jack's brother Frank, a partner and foreman at Morrison Brothers, was the plant's treasurer and general superintentent. John G. Schumacher, 53, died at his residence at Sandy Hook at 10 o'clock Thursday night, January 1, 1942, following an illness extending over a period of three years. The body was viewed at the Strueber Funeral Home after 10 o'clock, Saturday morning, January 3. The funeral of John G. Schumacher, Route No. 3, Dubuque, who died at his home near Kieler, Wis., Thursday, was held Monday, January 5, from the Strueber Funeral Home to the Sacred Heart Church in Dubuque, Ia., at 9 o'clock, with the pastor, the Right Rev. Monsignor Arnold Boeding, officiating. The Rev. Robert Palen, assistant pastor, officiated at graveside rites in Mount Calvary Cemetery, Dubuque, where burial was made. Pallbearers were Walter Schumacher, Warren Binhoff, Norman Binhoff, Wilbur Uthe, Karl Woelk [? ], and Joe Lange. Military services were in charge of the Veterans of Foreign Wars. Mr. Schumacher was survived by his spouse, Mayme Schumacher; his daughters Anna Mae, Rose, and June; five brothers, Frank, Joseph, George, Louis, and Albert Schumacher, all of Dubuque; and five sisters, Mrs. Louise Brazee, of Los Angeles, California; Mrs. Ewald (Anna) Gerken, of Dubuque; Mrs. Frank (Josephine) Sullivan of Chicago, Illinois; Mrs. Harold (Margaret) Casey, of Dubuque; and Mrs. Howard (Henrietta) Baumgartner, of Los Angeles, Calif. He was preceded in death by his parents and two sons. John Schumacher's uncle, Martin Hauser, died the same day as John did, on January 1, 1942. Martin was married to the former Katherine "Kate" Uthe, a sister of John's mother, Mathilda (Uthe) Schumacher. Mrs. Mayme M. Schumacher, 93, who resided with her daughter, Rose M. Pixler, in Dubuque, Iowa, died at noon Wednesday, February 18, 1998, at home. Family and friends called from 4 to 7 p.m., Friday, February 20, at Dennis Kitchen Funeral Home in Dubuque, where a St. Mary's Catholic Church Christian wake service was said at 4:15 p.m. Funeral services were held at 12:30 p.m., Saturday, February 21, at St. Mary's Catholic Church in Dubuque, where she was a member, with burial in Mount Calvary Cemetery at Dubuque. Mrs. Schumacher was survived by three daughters, Anna Mae (James) Lewis, Rose M. Pixler, and June L. Herzberg, all of Dubuque; six grandchildren, 15 great-grandchildren and 10 great-great-grandchildren; and several nieces and nephews. She was preceded in death by her parents, two sons, five brothers and five sisters. Anna Mae Schumacher was born in 1928, in Dubuque, Iowa, daughter of John "Jack" and Mayme (Wilhelm) Schumacher. Anna Mae Schumacher married Jim Lewis on Saturday, June 23, 1951, at Holy Ghost Catholic Church in Dubuque, Iowa. Wedding vows were repeated at 10 a.m. Saturday in Holy Ghost church by Miss Anna Mae Schumacher, daughter of Mrs. Mamie Schumacher, of 3198 Central avenue, and James Lewis, son of Roy Lewis, of Durango. The bride wore a white linen suit and navy accessories. Her corsage was of pink carnations. Mrs. Kenneth Ward [June] attended her sister as matron of honor. She wore a pink linen suit with navy accessories and a white carnation corsage. Best man was John Cain, of Rockdale. The bride's mother wore a navy blue silk dress and a pink carnation corsage. A wedding dinner for the couple's immediate families was at the Chateau. The couple will return July 9 from a honeymoon in Florida to live at 3198 Central avenue. The bride is employed at A.Y. McDonald Manufacturing company. The bridegroom is an employe of Farley and Loetscher Manufacturing company. Jimmy Lee Lewis was born in 1929, in Iowa, son of Roy and Blanche M. (Whitehead) Lewis. In 1991, Jim and Anna Mae Lewis of Dubuque, Iowa, celebrated their 40th wedding anniversary with a surprise party on on June 15 at Eagle Point Park in Dubuque, and a family dinner. Their children are Dianne Engling and Laure Lewis, both of Dubuque. They have three grandchildren. Rose Marie Schumacher was born circa 1929-30, in Iowa, daughter of John "Jack" and Mayme (Wilhelm) Schumacher. Rose attended Immaculate Conception Academy before becoming an employe of the Dubuque Packing company. Rose married Howard O. Pixler on October 15, 1971, in Las Vegas, Nevada. Howard Pixler was born on March 11, 1916, in Pierson, Iowa, son of Jess G. and Elva A. (Barkley) Pixler. He grew up in Pierson and graduated from the Grand Meadows Consolidated High School in 1933, in Grand Meadow Township, Cherokee County, Iowa. Howard was president and owner and operator of the Pixler Electric Company for 45 years. He retired in 1988. He was a member of the Grandview Avenue United Methodist Church, Mason Temple, Mosaic Lodge 125 A.F. & A.M.. Julien Chapter 125 Order of the Eastern Star and the Oxus Grotto Mystic Order of the Veiled Prophets of the Enchanted Realm, in Asbury, Iowa. He was a longtime member of the Scottish Rite Bodies, Valley, of Clinton, Iowa, Dubuque Shrine Club and the Kaaba Shrine, Orient, of Davenport, Iowa. He was also a member of the Kiwanis Club and served for many years on the Board of Directors of the Asbury Volunteer Fire Department. Howard O. Pixler, 78, of Dubuque, Iowa, died at 11:15 a.m., Friday, March 3, 1995, at The Finley Hospital in Dubuque. Services were held at 10 a.m., Tuesday, March 7, at Dennis Kitchen Funeral Home in Dubuque, where family and friends called from 3 to 8 p.m., Monday, March 6. Burial was in Linwood Cemetery in Dubuque. He was survived by his wife, Rose M. (Schumacher) Pixler; two stepdaughters, Mrs. James (Mary) Juneau and Sandra Burba, both of Dubuque, Ia. ; five grandchildren and a great-grandchild; two brothers, Lester (and Bea) Pixler, of Santa Barbara, Calif., and his twin brother, Ivan (and Doris) Pixler, of Spencer, Ia. ; and two sisters, Mrs. Thelma Armstrong, of Calamus, Ia., and Mrs. Myrna Lambert, of Roy, Utah. He was preceded in death by his parents; a brother, Oliver Pixler; and a sister, Opal McQueen. June Laurine Schumacher was born on June 15, 1930, in Dubuque, Iowa, daughter of John "Jack" and Mayme (Wilhelm) Schumacher. June L. Herzberg, 80, of Sunnycrest Manor, Dubuque, Iowa, died Sunday, January 23, 2011, at Sunnycrest. Services were held at 7 p.m., Wednesday, January 26, at Hoffmann Schneider & Kitchen Funeral Home in Dubuque, where family and friends called after 4 p.m. Burial was in Mount Calvary Cemetery. She was survived by two children, John Herzberg, of California, and Sheryl Johnson, of Florida; several grandchildren; two sisters, Anna Mae (James) Lewis and Rose Pixler, both of Dubuque, Iowa; and several nieces and nephews. She was preceded in death by her parents and two brothers. Sources include news articles and obituaries from the Dubuque Telegraph Herald and online genealogical inforamtion at https://www.familysearch.org/. The letter from Jack Schumacher to his father George about the battle at Veracruz in Mexico was for many years in the possession of Teresa (Gerken) McCoy, whose mother Anna was Jack's sister. It was given to me by the McCoys following Teresa's death in 1993. The picture of Jack was one that belonged to Jack's sister Anna. T.L. Last revised June 2, 2013.